Nicest and cleanest hostel in Australia. All facilities in top condition, fast and reliable wifi in the lobby. A great communal atmosphere inside the kitchen and the spacious, shaded pattio area out back. Staff very helpful and seem to be operating a free shuttle service to anywhere you need. 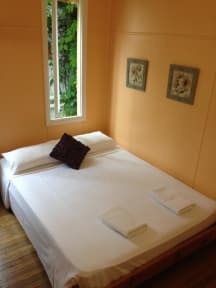 Stayed for 3 nights in an airconditioned 6-share, very reasonably priced at $18 per night. The staff was extremely nice and helpful during our entire stay. Room was decorated nicely and had all the necessary facilities available. 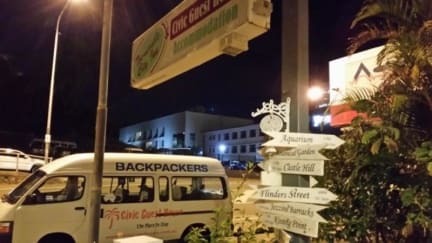 Location is also great although it is quite a walk to the sealink terminal, but Woolworths is only a short walk from the hostel. Only stayed for one short night but would definitely recommend this place if people I know are planning to stay in Townsville. Good hostel. There isn’t a lot to do in Townsville, but I liked to have a 1 night stopover here before heading to Magnetic Island. The facilities of this hostel are good: many bathrooms, good kitchen, fine rooms, enough common areas, wifi in the common area, free water tap, transport from and to ferry. A supermarket is nearby. Room for improvement: more plugs around each bed, bed lights, lockers. Overall I liked my stay. Many thanks to the friendly staff. Dit was een fijn hostel. Met een shuttlebusje werd ik opgehaald vanaf de greyhound stop. (Wel even bellen.) De sfeer in het hostel is relaxt, de wifi snel. De wasmachines en droger werken goed en er was ook voldoende plek om even een handwasje te doen en je was te drogen aan de lijn. De keuken was uitgebreid. Er was zelfs een oven! Ik zou hier zeker opnieuw verblijven. Cute small hostel, bathroom and toilet were a bit old and beds were cranky. Niet heel speciaal hostel. De kamer was netjes, net als de keuken. Iedereen is erg op zichzelf waardoor er weinig gepraat wordt helaas. Comfy private room with AC. Bathroom could have been a bit cleaner (lots of hair still in the shower). Nice big outside sitting area and kitchen at the back. Friendly staff. There was a free shuttle from the greyhound which was nice. Rooms were very spacious, but there were no lockers. Friendly staff. Only stayed there for one night before going to magnetic island, which was fine!